Maybe you’d like to start a puppet team in your ministry, but you don’t know how to begin. If that’s true, this blog will give you everything you need to get started. Actually I’m going to direct you to resources that will get you started. Most of these resources don’t come from me and I don’t earn anything from recommending them. I just know they work. If you know absolutely nothing about puppets, I recommend you start with this DVD: Puppet Ministry Basics and Beyond. It will tell you everything you need to know about puppets and more. It is well worth the money. Not only does it teach leaders to do puppets, you can show parts of it to your puppet team to instruct them and get them excited about what can be done. Conservative churches may not find all of the music and content on the puppet skits appropriate, but the DVD is worth it for the sections on puppet manipulation alone. Where do I access puppet scripts? You can find a wide variety of puppet scripts. This same company, Creative Ministry Solutions, has many. You’ll find others for sale, too. You’ll find at least twenty here, on my website, for free. When I look for a script, I look for one that is funny. If it’s not funny at all, it doesn’t really fit puppets. I also look for one with a simple message that is worth telling. I avoid scripts that twist Bible stories a little too far or border on being sacrilegious. Where do I access recordings for puppets? Some companies have recorded programs so the puppeteers only have to synchronize their puppets’ lips with the words. This may be easier for your puppeteers to work with at first. Sometimes this gives a more professional performance, though quality of recording differs greatly. If you have quite conservative standards, you may not be pleased with some of the contemporary music on many recordings. Years ago our daughter Lori led our puppet team using the songs off Patch the Pirate tapes. These recordings now exist on CD’s. They aren’t formatted especially for puppets, but many songs can work for puppets. These CD’s have fun songs that are acceptable to most conservative Christians. We continue to use these songs in our ministry today. You may want to order the songbooks (Patch the Pirate Praises, volumes 1-3) to copy the words of the song for your team to lip synch. Where do I buy puppets or patterns to make them? 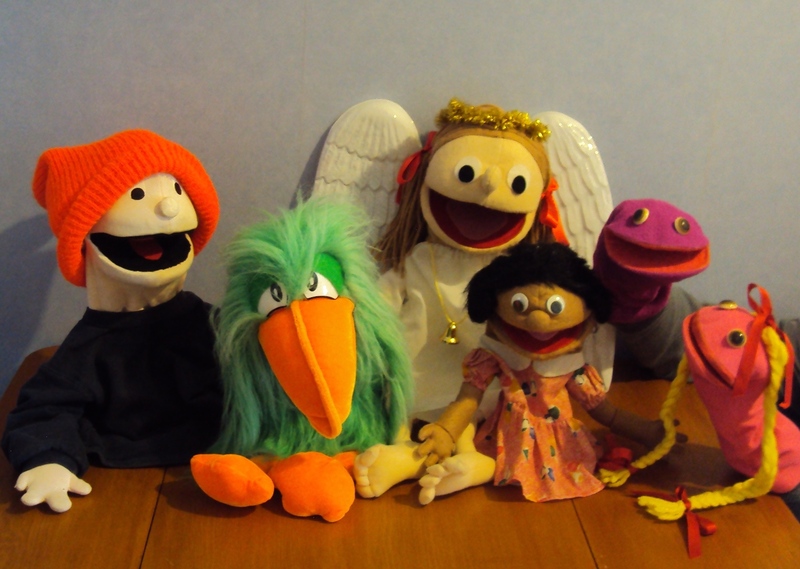 Creative Ministry Solutions has a wide variety of puppets. They also sell patterns to make them. This one is for people puppets. If you have a boy, girl, man, and woman puppet you can perform a wide variety of puppet scripts. We change the clothes of our puppets and add hats or novelty wigs to make them be a wide variety of characters. Sometimes well-selected used baby clothes work well for puppets. How can I make a puppet stage? Though I haven’t personally used this pattern, I’m sure this pattern would give you the instructions you needed to make a stage that would work for your ministry. With all these resources you should be able to start your own puppet team and bring joy and enthusiasm to your own ministry.